The medieval village of Trequanda, crowned by the remnants of the ancient Cacciaconti castle, is situated in the Crete Senesi, between the Val di Chiana and the Val d' Asso. The former medieval village still has visible remnants of its outer walls and two of the original three entrance portals. It stands on the top of a hill in a well maintained natural environment of woods, tidy fields of vines, olives and cereal crops. A third of the village is taken up by the castle Cacciaconti and its various annexes including a small ornamental garden, . The majestic stone tower, partly rebuilt after the war, dominates the entire complex from the north-east and is a singular witness to the original fortified castle structure. The piazza of Trequanda, with its old stone benches, instantly creates the feeling of a lively and much-loved village of the Sienese region. The small unusual Romanesque church, with a façade checkered in white and ochre, deserves of being named the parish church of the Saints Peter and Andrea, dating back to the 13th century. It is a beautiful Romanesque-gothic construction with a particular facade covered with white and ochre color stones forming a geometrical chessboard pattern. Inside the church, an Ascension attributed to Il Sodoma and a terracotta of Madonna with Child attributed to Andrea Sansovino. The high altar (15th century) is by Giovanni di Paolo. From the airy town square where stand the castle, town hall and the splendid Romanesque church of SS. Pietro and Andrea, the highest point of the hill, steep and narrow roads and alleys descend where the attentive visitor will be surprised to find ancient covered passages, small votive ceramics, family crests, and beautiful benches in travertine and tufa. 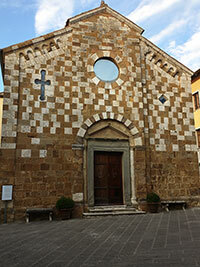 The Romanesque church of Saint Stefano a Cennano is also of particular interest. The Crete Senesi consists of a range of hills and woods among villages and includes the comuni of Asciano, Buonconvento, Monteroni d'Arbia, Rapolano Terme and San Giovanni d'Asso, all within the province of Siena. The magnificent hills of the Crete Senesi offer endless views with evocative and suggestive landscapes. Typical conformations of the land are the badlands, the calanchi and biancane that give the landscape its characteristic gray color and a sometimes lunar appearance. Trequanda is a comune (municipality) in the Province of Siena in Tuscany, located about 70 kilometres (43 mi) southeast of Florence and about 30 kilometres (19 mi) southeast of Siena. Trequanda borders the following municipalities: Asciano, Pienza, Rapolano Terme, San Giovanni d'Asso, Sinalunga and Torrita di Sienaand consists of the following frazioni (villages): Trequanda, Castelmuzio and Petroio. Breathtaking views, a few superb restaurants, and beautiful buildings, Trequanda has a lot to offer. This evocative itinerary covers all the highlights of the Crete in the Municipality of Trequanda and offers spectacular views of the clay hills with colors and light changing from hour to hour, and from season to season.Enjoy a croissant and coffee in the morning, and watch the locals pass by in Osteria Cafe Ciriera (Piazza Giuseppe Garibaldi 23, in front of the church), before taking off. The itinerary start in Trequanda, on the Piazza Giuseppe Garibaldi, in front of the beautiful chiesa dei Santi Pietro e Andrea. Behind the church is the Parco Ornella Pancirolli, a nice square for concerts and other events. Park your car here, on Via dei Giardini Pubblici, or on Via Cacciaconti, just outside the walls of Trequanda. Due to an unprecedented synergy between the Municipality and a private individual, Roberto Pancirolli, a Milanese entrepreneur who lived in Trequanda for more than twenty years, a parc was created in the center of Trequanda, the Parco Ornella Pancirolli. Already in 2007 this wealthy citizen, in memory of his wife Ornella, who died prematurely, had donated a park enriched with a soccer field and a basketball court, and an arena for concerts and dancing evenings. Later, a renovated building on the square behind the chiesa dei Santi Pietro e Andrea, which houses a kitchen, has enriched the park. The programme includes a varied selection of masterpieces, as well as lesser-known gems, from eight centuries of music history. On dream locations such as the churches of Santo Stefano (Castelmuzio, Trequanda), Sant’Anna in Camprena (Pienza) and San Francesco (Asciano) both music lovers and performers can discover the Crete Senesi. Casa Vacanze Podere Santa Pia is a beautiful stone farmhouse located in a strategic position, on a hill overlooking both the Val d'Orcia and the Valle d’Ombrone, only 2 km away from Castiglioncello Bandini. Podere Santa Pia is surrounded by a backdrop of hills and macchia mediterranea: wild, untamed and completely natural vegetation, wonderful for walking and exploring on a variety of different terrain with fantastic views everywhere you turn. There is a glorious walk through the woodland to one of the most spectacular views in Tuscany overlooking the Valle d’ombrone, the Val d’Orcia and some vineyards south of Montalcino. 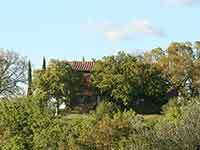 Podere Santa Pia is a homely furnished and rustic holiday home. The main house is spacious, comfortable and well furnished and offers its guests a breathtaking view over the Maremma hills.